Here we devote a section to certain elementary statements about the movement in men’s religious ideas during the fifteenth and sixteenth centuries. They are a necessary introduction to the political history of the seventeenth and eighteenth centuries that follows. We have to distinguish clearly between two entirely different systems of opposition to the Catholic church. They intermingled very confusingly. The church was losing its hold upon the consciences of princes and rich and able people; it was also losing the faith and confidence of common people. The effect of its decline of spiritual power upon the former class was to make them resent its interference, its moral restrictions, its claims to overlordship, its claim to tax, and to dissolve allegiances. They ceased to respect its power and its property. This insubordination of princes and rulers was going on throughout the Middle Ages, but it was only when in the sixteenth century the church began to side openly with its old antagonist the Emperor, when it offered him its support and accepted his help in its campaign against heresy, that princes began to think seriously of breaking away from the Roman communion and setting up fragments of a church. And they would never have done so if they had not perceived that the hold of the church upon the masses of mankind had relaxed. The revolt of the princes was essentially an irreligious revolt against the world-rule of the church. The Emperor Frederick III with his epistles to his fellow princes, was its forerunner. The revolt of the people against the church, on the other hand, was as essentially religious. They objected not to the church’s power, but to its weaknesses. They wanted a deeply righteous and fearless church to help them and organize them against the wickedness of powerful men. Their movements against the church, within it and without, were movements not for release from a religious control, but for a fuller and more abundant religious control. They did not want less religious control, but more-but they wanted to be assured that it was religious. They objected to the Pope not because he was the religious head of the world, but because he was not; because he was a wealthy earthly prince when he ought to have been their spiritual leader. The contest in Europe from the fourteenth century onward therefore was a three-cornered contest. The princes wanted to use the popular forces against the Pope, but not to let those forces grow too powerful for their own power and glory. For a long time the church went from prince to prince for an ally without realizing that the lost ally it needed to recover was popular veneration. Because of this triple aspect of the mental and moral conflicts that were going on in the fourteenth and fifteenth and sixteenth centuries, the series of ensuing changes, those changes that are known collectively in history as the Reformation, took on, a threefold aspect. There was the Reformation according to the princes, who wanted to stop the flow of money to Rome and to seize the moral authority, the educational power, and the material possessions of the church within their dominions. There was the Reformation according to the people, who sought to make Christianity a power against unrighteousness, and particularly against the unrighteousness of the rich and powerful. And finally there was the Refomation within the church, of which St. Francis of Assisi was the precursor, which sought to restore the goodness of the church and, through its goodness, to restore its power. The Reformation according to the princes took the form of a replacement of the Pope by the prince as the head of the religion and the controller of the consciences of his people. The princes had no idea and no intention of letting free the judgments of their subjects more particularly with the object-lessons of the Hussites and the Anabaptists before their eyes; they sought to establish national churches dependent upon the throne. As England, Scotland, Sweden, Norway, Denmark, North Germany, and Bohemia broke away from the Roman communion, the princes and other ministers showed the utmost solicitude to keep the movement well under control. Just as much reformation as would sever the link with Rome they permitted; anything beyond that, any dangerous break towards the primitive teachings of Jesus or the crude direct interpretation of the Bible, they resisted. The Established Church of England is one of the most typical and successful of the resulting compromises. It is still sacramental and sacerdotal; but its organization centres in the Court and the Lord Chancellor, and though subversive views may, and do, break out in the lower and less prosperous ranks of its priesthood, it is impossible for them to struggle up to any position of influence and authority. The Reformation according to the common man was very different in spirit from the Princely Reformation. We have already told something of the popular attempts at Reformation in Bohemia, and Germany. The wide spiritual upheavals of the time were at once more honest, more confused, more enduring, and less immediately successful than the reforms of the princes. Very few religious-spirited men had the daring to break away or the effrontery to confess that they had broken away from all authoritative teaching, and that they were now relying entirely upon their own minds and consciences. That required a very high intellectual courage. The general drift of the common man in this period in Europe was to set up his new acquisition, the Bible, as a counter authority to the church. This was particularly the case with the great leader of German Protestanism, Martin Luther (1483-1546). All over Germany, and indeed all over Western Europe, there were now men spelling over the black-letter pages of the newly translated and printed Bible, over the Book of Leviticus and the Song of Solomon and the Revelation of St. John the Divine strange and perplexing books-quite as much as over the simple and inspiring record of Jesus in the Gospels. Naturally they produced strange views and grotesque interpretations. It is surprising that they were not stranger and grotesquer. But the human reason is an obstinate thing, and will criticize and select in spite of its own resolutions. The bulk of these new Bible students took what their consciences approved from the Bible and ignored its riddles and contradictions. All over Europe, wherver the new Protestant churches of the princes were, set up, a living and very active residuum of Protestants remained who declined to have their religion made over for them in this fashion. These were the Nonconformists, a medley of sects, having nothing in common but their resistance to authoritative religion, whether of the Pope or the State. Most, but not, all of these Nonconformists held to the Bible as a divinely inspired and authoritative guide. This was a strategic rather than an abiding position, and the modern drift of Nonconformity has been onward away from this original Bibliolatry towards a mitigated and sentimentalized recognition of the bare teachings of Jesus of Nazareth. Beyond the range of Nonconformity, beyond the range of professed Christianity at all, there is also now a great and growing mass of equalitarian belief and altruistic impulse in the modern civilizations, which certainly owes, as we have already asserted, its spirit to Christianity, which began to appear in Europe as the church lost its grip upon the general mind. Let us say a word now of the third phase of the Reformation process, the Reformation within the church. This was already beginning in the twelfth and thirteenth centuries with the appearance of the Black and Grey Friars (Chap. XXXII, sec 13). In the sixteenth century, and when it was most needed, came a fresh impetus of the same kind. This was the foundation of the Society of the Jesuits by Inigo Lopez do Recalde, better known to the world of to-day as St. Ignatius of Loyola. Ignatius began his career as a very tough and gallant young Spaniard. He was clever and dexterous and inspired by a passion for pluck, hardihood, and rather showy glory. His love affairs were free and picturesque. In 1521 the French took the town of Pampeluna in Spain from the Emperor Charles V, and Ignatius was one of the defenders. His legs were smashed by a cannon-ball, and he was taken prisoner. One leg was badly set and had to be broken again, and these painful and complex operations nearly cost him his life. He received the last sacraments. In the night, thereafter, he began to mend, and presently he was convalescent and facing the prospect of a life in which be would perhaps always be a cripple. His thoughts turned to the adventure of religion. Sometimes he would think of a certain great lady, and how, in spite of his broken state, he might yet win her admiration by some amazing deed; and sometimes he would think of being in some especial and personal way the Knight of Christ. In the midst of these confusions, one night as be lay awake, he tells us, a new great lady claimed his attention; he had a vision of the Blessed Virgin Mary carrying the Infant Christ in her arms. «Immediately a loathing seized him for the former deeds of his life». He resolved to give up all further thoughts of earthly women, and to lead a life of absolute chastity and devotion to the Mother of God. He projected great pilgrimages and a monastic life. His final method of taking his vows marks him the country-man of Don Quixote. He had regained his strength, and he was riding out into the world rather aimlessly, a penniless soldier of fortune with little but his arms and the mule on which he rode, when he fell into company with a Moor. They went on together and talked, and presently disputed about religion. The Moor was the better educated man; he had the best of the argument, he said offensive things about the Virgin Mary that were difficult to answer, and he parted triumphantly from Ignatius. The young Knight of our Lady was boiling with shame and indignation. He hesitated whether he should go after the Moor and kill him or pursue the pilgrimage he had in mind. At a fork in the road he left things to his mule, which spared the Moor. He came to the Benedictine Abbey of Manresa near Montserrat, and here he imitated that peerless hero of the mediaeval romance, Amadis de Gaul, and kept an all-night vigil before the Altar of the Blessed Virgin. He presented his mule to the abbey, he gave his worldly clothes to a beggar, he laid his sword and dagger upon the altar, and clothed himself in a rough sackcloth garment and hempen shoes. He then took himself to a neighbouring hospice and gave himself up to scourgings and austerities. For a whole week he fasted absolutely. Thence he went on a pilgrimage to the Holy Land. For some years he wandered, consumed with the idea of founding a new order of religious knighthood, but not knowing clearly how to set about this enterprise. He became more and more aware of his own illiteracy, and the Inquisition, which was beginning to take an interest in his proceedings, forbade him to attempt to teach others until he had spent at least four years in study. So much cruelty and intolerance is laid at the door of the Inquisition that it is pleasant to record that in its handling of this heady, imaginative young enthusiast it showed itself both sympathetic and sane. It recognized his vigour and possible uses; it saw the dangers of his ignorance. He studied at Salamanca and Paris, among other places. He was ordained a priest in 1538, and. a year later his long-dreamt-of order was founded under the military title of the «Company of Jesus». like the Salvation Army of modern England, it made the most direct attempt to bring the generous tradition of military organization and discipline to the service of religion. 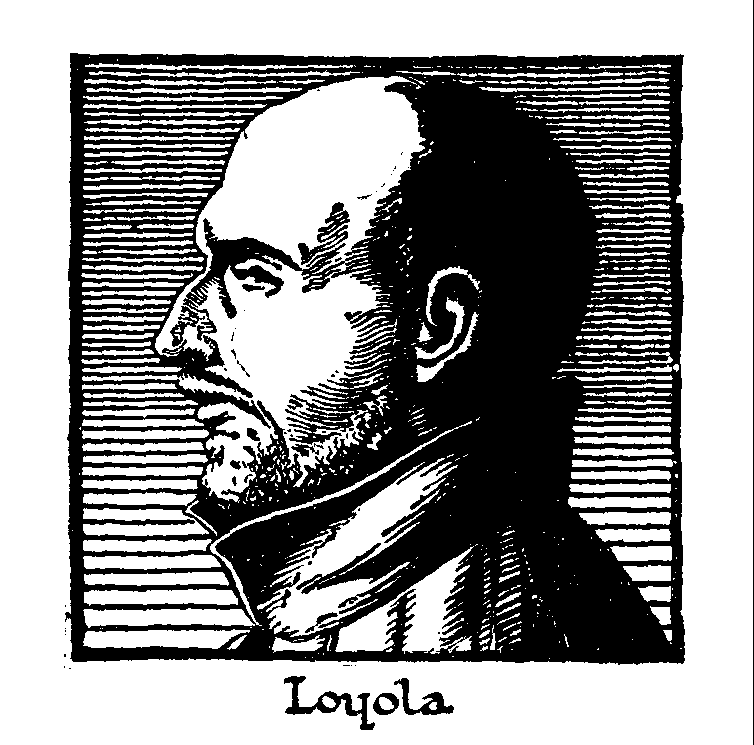 This Ignatius of Loyola who founded the order of Jesuits was a man of forty-seven; he was a very different man, much wiser and steadier, than the rather absurd young man who had aped Amadis de Gaul and kept vigil in the abbey of Manresa; and the missionary and educational organization be now created and placed at the disposal of the Pope was one of the most powerful instruments the church had ever handled. These men gave themselves freely and wholly to be used by the church. It was the Order of the Jesuits which carried Christianity to China again after the downfall of the Ming Dynasty, and Jesuits were the chief Christian missionaries in India and North America. To their civilizing work among the Indians in South America we shall presently allude. But their main achievement lay in raising the standard of Catholic education. Their schools became and remained for a long time the best schools in Christendom. Says Lord Verulam. (= Sir Francis Bacon): «As for the pedagogic part… consult the schools of the Jesuits, for nothing better has been put in practice». They raised the level of intelligence, they quickened the conscience of all Catholic Europe, they stimulated Protestant Europe to competitive educational efforts…. Some day it may be we shall see a new order of Jesuits, vowed not to the service of the Pope, but to the service of mankind. And concurrently with this great wave of educational effort, the tone and quality of the church was also greatly improved by the clarification of doctrine and the reforms in organization and discipline that were made by the Council of Trent. This council met intermittently either at Trent or Bologna between the years 1545 and 1563, and its work was at least as important as the energy of the Jesuits in arresting the crimes and blunders that were causing state after state to fall away from the Roman communion. The change wrought by the Reformation within the Church of Rome was as great as the change wrought in the Protestant churches that detached themselves from the mother body. There are henceforth no more open scandals or schisms to record. But if anything, there has been an intensification of doctrinal narrowness, and such phases of imaginative vigour as are represented by Gregory the Great, or by the group of Popes associated with Gregory VII and Urban II, or by the group that began with Innocent III, no longer enliven the sober and pedestrian narrative. The world war of 1914-1918 was a unique opportunity for the Papacy; the occasion was manifest for some clear strong voice proclaiming the universal obligation to righteousness, the brotherhood of men, the claims of human welfare over patriotic passion. No such moral lead was given. The Papacy seemed to be balancing its traditional reliance upon the faithful Habsburgs against its quarrel with republican France. But Nonconformity was stamped out in Germany. See par. 11B of this chapter.